Well I thought this was going to be big news. 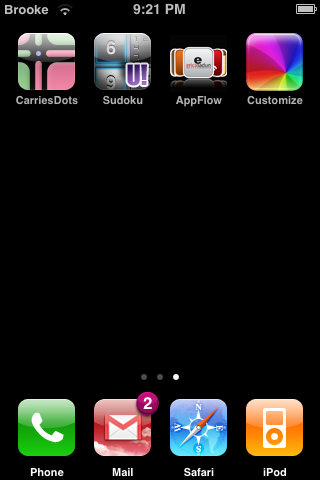 And, it’s a start… If you remember Customize you know what I’m talking about. But for those of you who don’t, here’s a little info. Customize lets you change all kinds of things on your iPhone or iPod Touch: sounds, system strings (like the Slide to Unlock text), icons, wallpaper, etc. There’s also a huge theme database within the app. It’s all very nice but tonight, it’s just not working for us. Very buggy, crashing our iPhones, not keeping changes, etc. We’ll keep testing it and watching for updates but I’d wait on this one for now. 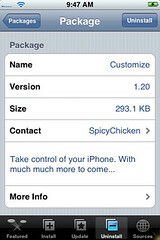 Customize 2.2.1 (compatible with iPhone 2.2.1 firmware) is now available. You can download it here: http://customizeapp.com/uploads/release/Customize-2.2.1.zip. 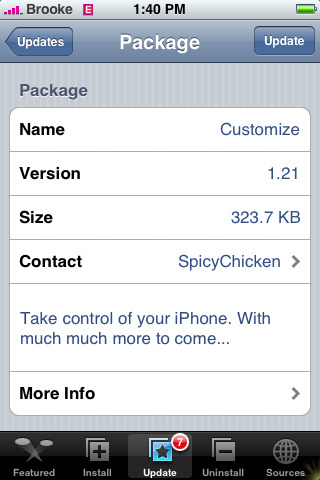 It will also become available through Cydia Installer soon. Check out some of our past articles on Customize. Thanks to Ed for tipping us off to this! Now that Customize is available via Cydia, I deleted the Customize.app file I had installed via SSH and installed it through Cydia (which I recommend doing so that you will see all the updates for the app). Before I manually deleted Customize, I reset my iPhone back to stock. When I installed Customize through Cydia and then opened the application, I did get a pop-up saying that it was unable to reach the Customize servers. However, their entire website is down so that is just a temporary error until their servers are back up. Besides that, Customize worked great. The app opened the first time I opened it and I was able to change my dock, system strings, battery…etc with no problem. Once spicychicken’s servers are back up…you will be good to go! Time to start customizing! • Incorporated an AutoUpdate utility – I have already used this feature of Customize and it did indeed notify me that there was an update. You can then update right in the application. However, when I updated through Customize, it did not show up in my Installer as an updated version. • Added ability to contact the Creator via Mail.app – This is a great feature. In the Theme Broswer, when you are in the more info screen for an item, you can tap on Creator and it will open an email with that person’s email address so that you can contact them directly. A new version of Customize was released today via the ModMyiFone source. The update adds a feature called Freeboard. Freeboard is a SummerBoard “replacement.” However, before you use Freeboard please read the warning below. Customize has released an update that has a SummerBoard replacement built in called “FreeBoard”. If you enable this feature, it will disable SummerBoard. At this point, you probably do *not* want to do this. And enabling FreeBoard could cause your phone to stop booting. The iPhone has about an 80 app limit. This includes webclips. Once you hit this limit, your phone won’t boot. It just spins and reboots over and over again. SummerBoard patches this bug (bug by Apple, fix by SummerBoard). If you enable FreeBoard feature within Customize, you will lose SummerBoard’s fix. If you have more than 80 apps, you will not be able to boot. Well guys, all I can tell you about this update is that there were, “Lots of bug fixes.” I know quite a few of you are having issues with Customize opening and then closing back to the SpringBoard. I never had that issue so, I can’t tell you for sure if this update fixes it or not. If you were having that issue, let me know in the comments if it fixes it for you!! Customize is available through the Ste Packaging source. There are no visual changes to version 2.0.0B9 of Customize. Just some bug fixes and efficiently upgrades. Customize is avilable through the Ste Packaging source. So far all we can tell that has changed with the update is that the options for “Manual Reorder” and “Number Dock Icons” have been swapped. 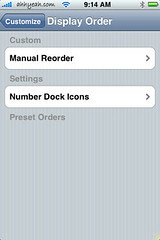 “Manual Reorder” is now first.